Click here for a PDF of the "Ticket Pre-Order Form." 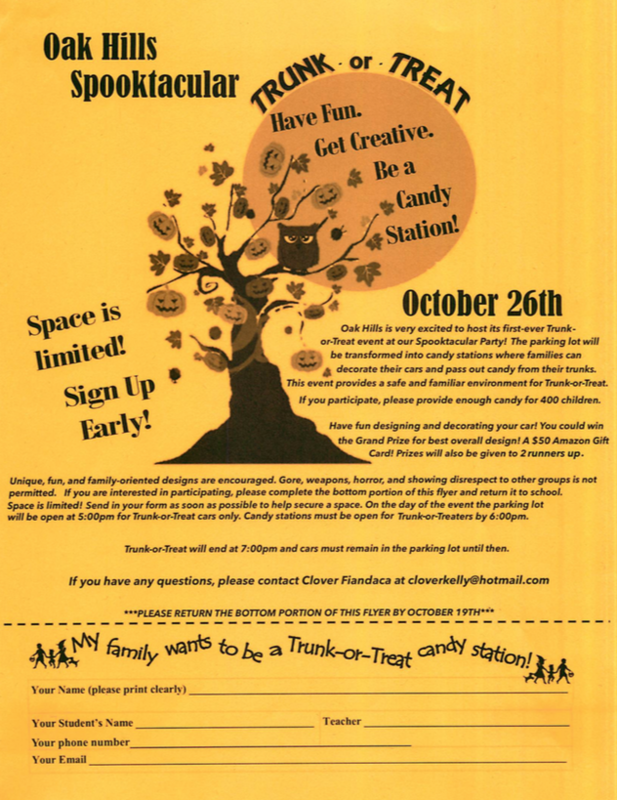 Click here for a PDF of the "Trunk-Or-Treat Station Sign-Up Form." Trunk-Or-Treat - It is not too late to sign up to be a part of our Trunk-Or-Treat! Please e-mail Clover Fiandaca (cloverkelly@hotmail.com) if you would like to participate. If you have already purchased tickets for the 'Spooktacular' event, they will be coming home in your child's backpack on Wednesday Oct 24th. If you send in your form after Tuesday Oct 23rd, then your tickets will be available for pick up at the event. Tickets will also be available for purchase at the door. turn in your Fall Fundraiser donations and earn raffle tickets! ​at our Spooktacular event (you need not be present to win). Can you serve as a VOLUNTEER and help make this event a success?